Geoff Baker and Hal Bernton of The Seattle Times won first place in the Associated Press Sports Editors 2017 contest in explanatory writing in the 75,000-175,000 circulation category. Baker and Bernton won for a story about a former Seattle Seahawks player fighting the team over painkiller handouts while he was a player. 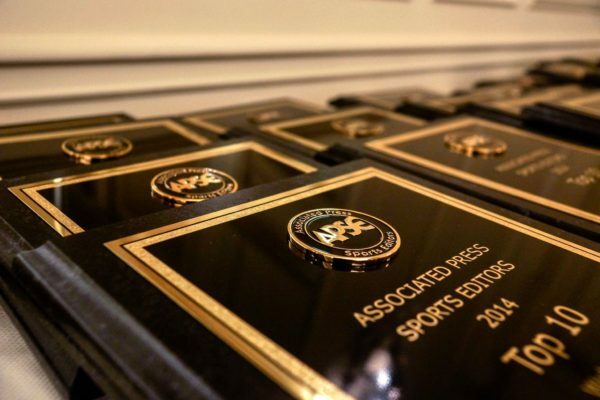 They will be presented a first-place plaque at the 2018 APSE banquet. The banquet and awards dinner concludes the APSE Summer Conference June 17-20 at the Marriott Hotel Nashville/Vanderbilt University. The second- through 10th-place winners will receive frameable certificates. Second place went to Andrew Greif of The Oregonian/OregonLive for a story about University of Oregon football. Third place went to Tim Sullivan of The Courier-Journal in Louisville, Ky., about the legacy of former Louisville athletic director Tom Jurich. Explanatory stories include trends, issues, original ideas and should explain something. They shed new light on issues and personalities in the news. The top 10 is listed below with links to writers’ Twitter pages, APSE member websites and the winning entries. Can superhuman athletes provide genetic clues on heart health?